The God’s Not Dead series third offering: A Light in Darkness brings the return of Reverend Dave Hill, Josh Wheaton and Reverend Jude, as well as a special appearance by the News Boys. This time we find Reverend Dave Hill is in the spotlight and has a battle on his hands that seems way beyond his capabilities to resolve or come to terms with. Freshly released from prison for failing to release transcripts of his sermons, Dave finds a true friend and ally in Reverend Jude as he continues to preach the Word of God in his church amidst rising tensions. The political climate is tense on the university campus. With changing times, the relevance of the presence of a church within the university grounds has come under scrutiny, and protesters rally to have it removed. While others argue that the freedom to worship should be there for those who want it, the matter gets out of hand when a vandalism-gone-wrong ignites the grand 150 year old building, and the outcome is devastating. 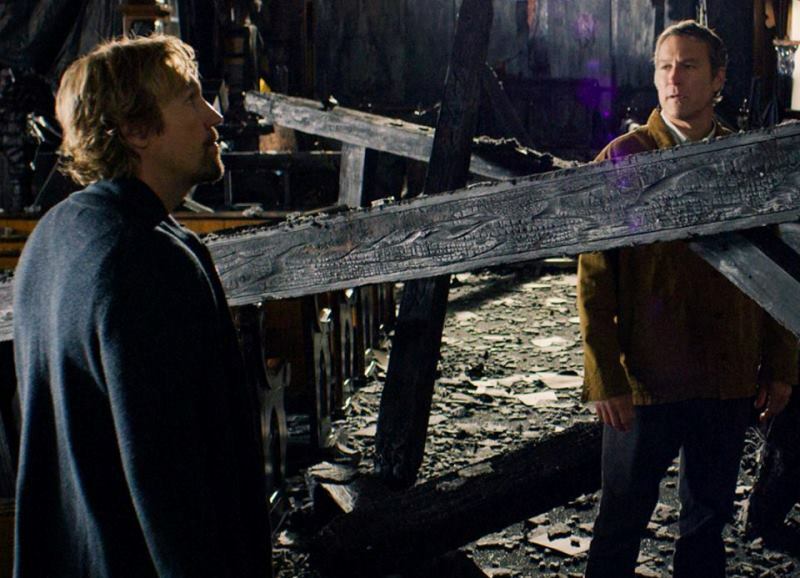 Dave finds himself in the struggle of a lifetime and calls on his atheist lawyer brother, Pearce (John Corbett) for help in fighting for the justice of the church building. The two brothers are humorous in their annoying brother antics, giving much needed lightness throughout, but as they pursue the same outcome, their life experiences clash and they are confronted by the different paths each has taken. What I like about the God’s Not Dead movies, is that there is no easy resolution to the stories of each character. We are evenly weaved in and out of the character’s stories on both sides of the issues. Each angle is so unique and worthy of understanding, drawing out an empathy for even the most unlikely of characters. As each character wrestles through their issues, we the viewers wrestle with them. This movie addresses the doubt of once-believers, the frustration and anger of believers whose faith has been belittled, and gives a sympathetic look at those who have left the church, calling forth love for our lost brothers and sisters. We get a confronting glimpse of why some people leave the church and what may be happening in their hearts. It honestly deals with faults in the church, as well as outside the church, with a well-rounded effectiveness, cleverly presented in a palatable yet compelling way. The movie aptly crescendos with the rawness of harsh truths coming to light, causing Reverend Dave to confront his anger and pain and let God do His work in the situation. It is a call for surrender to God, a call for understanding and a call for a deeper love. It is a call to lay down our banners and start listening. This film is honest, raw and intelligent while smacking a punch to the heart. It is not worthy of the negative reviews that faith films generally attract. While fires flare, God continues to love, and we see that His ways are not always our ways—His ways are much better. When the light shines, it transforms everything around it. Church is not just a building, it is a people who are willing to let the light shine through.